Age Related Macular Degeneration (AMD) is a is a leading cause of vision loss in seniors in which the central portion of the retina, called the macula, is damaged as a result of the hardening of the small arteries supplying oxygen and nutrients to the retinal tissue. The eye doctors at Northwest Indiana Eye & Laser Center provide comprehensive exams, testing, diagnosis and treatment of Age Related Macular Degeneration (AMD). 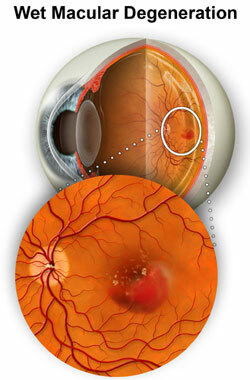 There are two main types of Age Related Macular Degeneration: Dry Macular Degeneration and Wet Macular Degeneration. Dry Macular Degeneration is the most common type of Age Related Macular Degeneration making up 85-90% of cases, resulting in a slow progressive loss of vision. Typically, we see small, yellow colored deposits between the retinal layers, which are called Drusen. Many people 50 years of age or older begin to display some Drusen as they age and you may be asked to schedule eye examinations more frequently in order to monitor them as there is some possibility that Dry Macular Degeneration will progress to Wet Macular Degeneration over a period of time. Thus people with Dry Macular Degeneration, even without any noticeable change in vision, need to be followed closely as Wet Macular Degeneration has far more serious consequences for vision loss. Fortunately, Wet Macular Degeneration only accounts for about 10-15% of cases as it is likely to cause far more serious vision and often catastrophic vision loss if not detected and treated quickly. Wet Macular Degeneration is characterized by an abnormal growth of new blood vessels under the retina, called “neovascularization,” which is prone to be leaky and can easily break and bleed. If leakage occurs, the macula may actually begin to swell, bleed and scar causing severe loss of central vision, which may be irreversible. Anyone over the age of 50, and especially seniors, should take a moment to learn about risk factors for age related macular degeneration (AMD). YOU can make a difference in preserving your vision by knowing your risk factors, being aware of your family history, and scheduling regular eye exam appointments. As with many age related eye problems, the key to preventing vision loss from age related macular degeneration is early detection, diagnosis and treatment as recommended by your eye doctor. If you have any two of these risk factors, you should schedule an appointment for a complete eye exam and evaluation. We may recommend certain lifestyle choices and preventative measures to help you manage the risks and hopefully reduce your risk of vision loss. Early detection, diagnosis and treatment are the keys to preventing vision loss from Macular Degeneration. It is often possible to detect early signs of Macular Degeneration during your regular eye examination, so scheduling regular eye exams is an excellent way to make an early diagnosis of Macular Degeneration. If you are over the age of 40-45 and you have a family history of Macular Degeneration, we recommend that you have a thorough eye examination, including a dilated retinal evaluation, each year. Please be sure to tell our staff if you have a family history of Macular Degeneration. 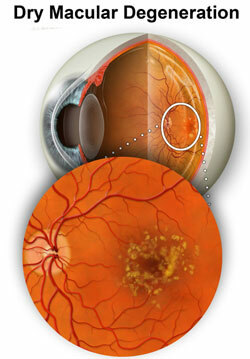 It is also important to know the symptoms of Macular Degeneration. If at any time you experience “distortion” or “twisting”, “shadowing” or “bending” of objects in your vision, you should schedule an appointment immediately. During your eye examination, eye drops will be used to dilate your pupils in order to carefully examine the macula and retina using various types of instruments and sources of high magnification including special contact lenses and ophthalmoscopes. The Amsler Grid Test helps identify distortion of your central vision, and may be a subtle indication of swelling or fluid under the Macula. In order to most precisely diagnose Macular Degeneration, it may be necessary to have detailed color photographs of your macula and retina taken as well as a Fluorescein Angiogram (FA). After a fluorescent dye is injected into your arm, a series of photographs will be taken in rapid succession using a high-speed digital retinal camera as the dye passes throughout the retinal blood vessels. From these pictures it will be possible to see any fluid leakage or new blood vessel growth beneath the retina which will tell us whether certain types of treatments such as VEGF Inhibitor Injections might help stabilize your vision and prevent vision loss. Today, thanks to the advances in treating Wet Macular Degeneration, if caught early, it may be possible to avoid suffering significant vision loss. We also use the advanced computer imaging technology called OCT or Optical Coherence Tomography that creates digital images of the retina and macula through the use of special beams of light in order to create a contour map of the retina and macula and detect microscopic changes in thickness or the accumulation of fluid beneath the retina or macula. This technique is similar to the CT Scans used to study organ systems and tissues throughout your body. If Macular Degeneration is diagnosed early enough, we are very fortunate to have a number of possible treatment options that may help to slow or even halt the progression of vision loss. However, patients must understand that once the macula has been damaged, there is no treatment that currently can reverse that damage and the associated loss of vision. A specific protein called “Vascular Endothelial Growth Factor” (VEGF) causes the growth of new blood vessels or “neovascularization” to occur in the eye. From this work, drugs that can be injected into the eye in order to slow or stop the growth of new blood vessels have been developed. Two drugs, Eylea® and Lucentis® have been developed and FDA approved with specific indications to treat Wet Macular Degeneration. Each of these drugs works by inhibiting Vascular Endothelial Growth Factor (VEGF) so that there is little or no stimulus to grow new blood vessels in the Retina. 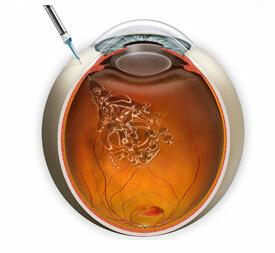 Eylea® and Lucentis® Injections are intravitreal injections-that means an injection that is placed directly into the Vitreous of the eye. Generally they need to be repeated every four to six weeks. Clinical studies of these anti-VEGF Injections indicate that when given to patients who have evidence of new blood vessel formation monthly, over 90% of patients will maintain their vision. It is believed that nutrition may play a role in the likelihood of developing Macular Degeneration. Studies indicated that people who have a diet that is rich in fruits and vegetables-particularly green leafy vegetables-have a considerably lower incidence of Macular Degeneration. The Age Related Eye Disease Study (AREDS), which was sponsored by the National Eye Institute, showed that taking high levels of antioxidants and Zinc could reduce the risk of developing Age Related Macular Degeneration by about 25%. This is not a cure, but we need to consider this information as a possible way to help patients who are at risk for Age Related Macular Degeneration (AMD), prevent vision loss. Before patients begin taking any course of vitamin or antioxidant supplements, you should fully discuss the risks and benefits with your eye doctor, who in consultation with your family physician or Internist, will determine whether this is safe and effective for you to try.